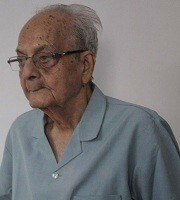 Rafiq Pilibhiti was born in Pilibhit in 1933. Even though he had a passion for poetry, family compulsions made him opt for engineering as a career. He made up by earning a Masters degree in Urdu at the age of 50. Though Rafiq Pilibhiti has been an engineer by profession, he has never given up reciting or writing poetry. He has published several volumes of Urdu poetry and translations of classical Urdu poetry too. According to Shama Hasan from BBC Urdu, Rafiq Pilibhiti has great respect for Allama Iqbal. While on one hand his couplets provide a soothing music of life, on the other hand they carry the subjects of pain and sorrow and for this reason his couplets are full of effect.. He has been inspired by the classical poets of Urdu and has written many verses in their style. His poetry has also dealt with current social and political issues. Now as an octogenarian, and still very active, he and his daughter Sami Rafiq have translated the selected poems of Firaq into English.